CARBONDALE, Ill. — To prepare students for a career with the major automotive manufacturers, American Suzuki Motor Corp. will donate 10 vehicles to Southern Illinois University Carbondale’s nationally recognized Department of Automotive Technology. 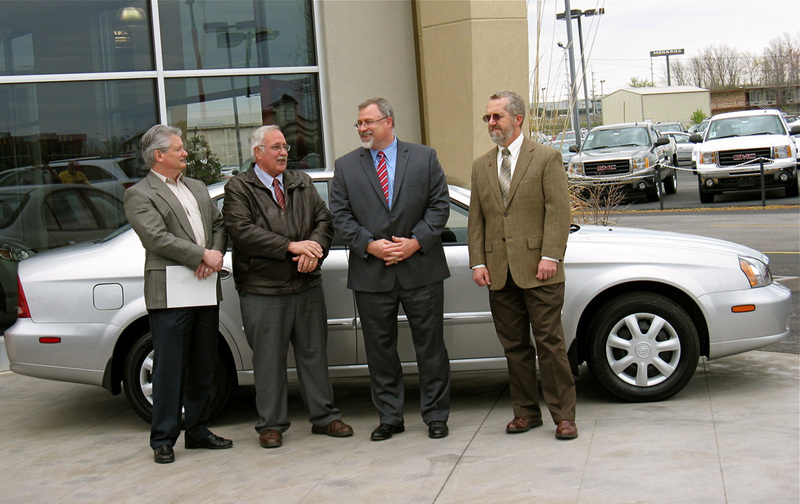 Lee Raines, regional services and parts manager, Southern Region, American Suzuki Motor Corp., announced the gift of 10 Suzuki Veronas to SIU Carbondale on April 2 at a ceremony at Foley-Sweitzer Suzuki in Marion. Manufacturer support is a vital component in keeping the automotive technology program among the nation’s elite, said Raines, who earned his bachelor’s degree in advanced technical studies-automotive technology management from SIUC in 1986. “The students win. The University wins and the manufacturer wins by creating future professionals who know and want to work on and with the products donated,” he said. “It creates an environment of cooperation, development and future business relations and awareness that may never have occurred otherwise. “It’s important for all of our futures to work together to advance our education system as well as our industry,” he said. Raines and department chair Jack S. Greer participated in a ceremonial key exchange for the mid-sized sedans at today’s announcement. Suzuki’s gift is the single largest donation of vehicles at one time the program has ever received, Greer said. Raines is the catalyst for the donation from Suzuki, Greer said, noting that the automaker has hired several program graduates. Raines is a member of the department’s automotive technology advisory board. Students will use the vehicles to hone their diagnostic skills, Greer said. In addition, students benefit by studying the vehicle’s operating systems and latest technological advances. Donations of vehicles, tools, equipment and financial gifts enabled the program “to become the No. 1 automotive program in the country,” Raines said. “My own commitment to SIUC and the automotive program stems from the fantastic education as well as life lessons learned while attending the University myself,” he said. “I must say that the manufacturers who donated not only their vehicles, tools, and equipment, but also their time have had a great impact on me personally. That fact that I was able to learn on live vehicles while using modern equipment enabled me to earn and pay for my education in my chosen field while attending SIUC. Jim Sweitzer, dealer principal, and Tim Deaton, Suzuki sales manager at Foley-Sweitzer Suzuki, both said the “substantial donation” greatly benefits the local community. There are more than 200 students enrolled in the automotive technology program. Facilities on SIUC’s campus in Carterville have housed the program’s technical courses since its inception in 1952. In addition to its program at SUIC, since fall 2007, Chicago-area students can obtain a bachelor’s degree in automotive technology through off-campus programs at Harry S. Truman College. Students complete an associate of applied science degree from Kennedy-King College or Truman College, and then transfer into SIUC’s automotive technology program, where SIUC faculty teach upper-level automotive technical and automotive management courses at Truman College. In 2005, the automotive technology program earned the Automotive Industry Planning Council’s Award of Excellence — its third time as the nation’s top program. The program also earned top honors in 1991 and 1999; national winners cannot compete again for the award for five years. The Brea, Calif.-based Automotive Operations of American Suzuki Motor Corp. was founded in 1963 byparent company Suzuki Motor Corp. (SMC) and markets its vehicles in the United States through a network of approximately 400 automotive dealerships and numerous other motorcycle, ATV and marine distributors in 49 states, according to the company. With global headquarters in Hamamatsu, Japan,SMC is a diversified worldwide automobile, motorcycle and outboard motor manufacturer. In 2008, SMC sold more than two million new cars and trucks and more than three million motorcycles and ATVs. Founded in 1909 and incorporated in 1920, SMC has operations in 193 countries and regions.